Moving the many, one at a time. Unsurprisingly and quite rightly, we’re constantly challenged by clients to justify why a physical experience is a more effective form of communication than other methods. More traditional channels - print, TV, Online and radio have well-established metrics against which success can be judged and investments made. But it’s different for our work - while common sense dictates that you’re more likely to remember something you physically experience than something you see, hear or read, there’s no real data available that directly compares the effectiveness of these four channels. So we decided to try and gather some of our own. We conducted a 2-part research programme to learn more about the effectiveness of experience against more conventional marketing methods. The research consisted of a nationally representative US and UK consumer survey, an informal experiment and short follow-up interviews - designed to find out what people felt about brand experiences to help demonstrate the effectiveness and value of experiential marketing. For the informal experiment we invented a non-alcoholic brand called Sevillian and invited participants to either read, listen, watch or take part in a mocktail making experience. 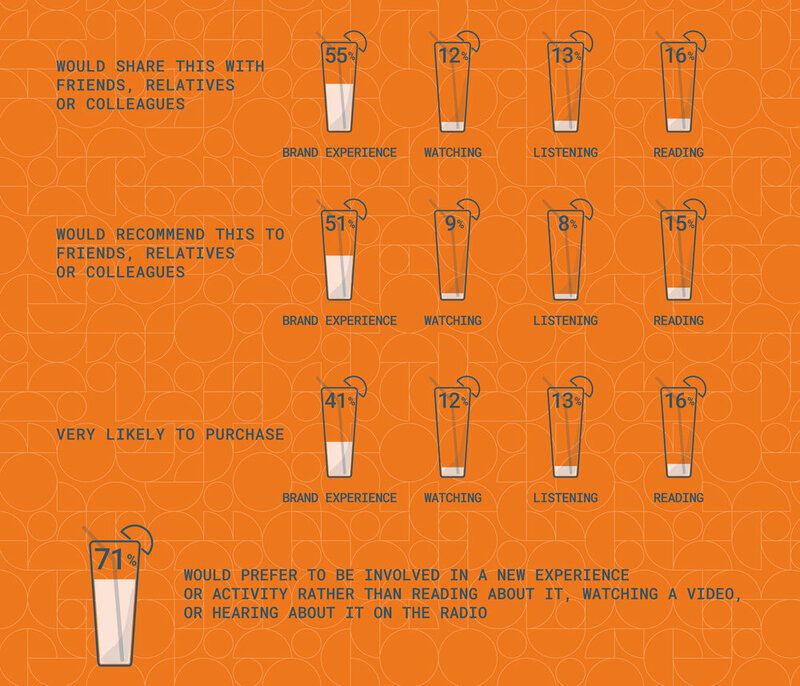 Click to request a copy of the full report or connect to see how we can help you create experiences that count.